Jos Buttler slammed his third half-century of the season to take Rajasthan Royals to a win over Mumbai Indians at the Wankhede on Saturday. 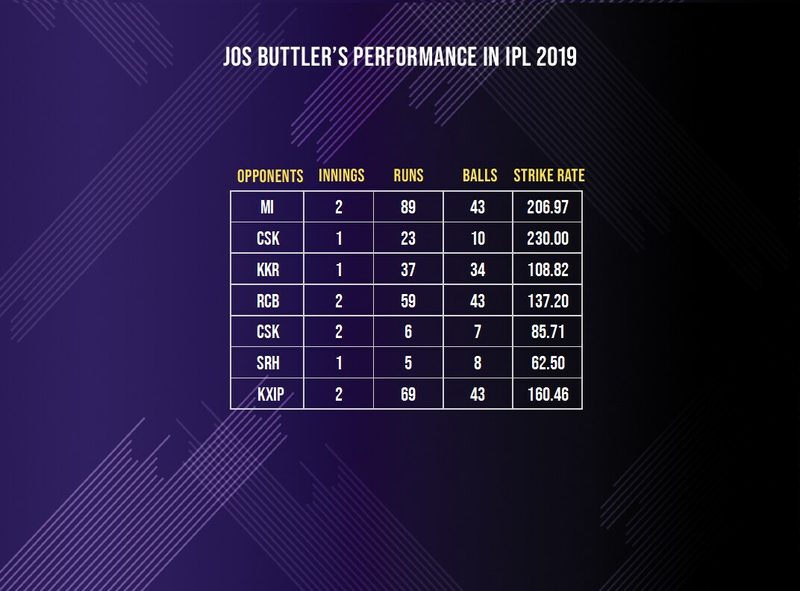 Continuing his good form in run-chases this season, Buttler went from 53 off 33 balls to 89 in 43 balls, taking 36 runs off his final 10 balls including 28 in an over off Alzarri Joseph. Buttler was in terrific form at the Wankhede and used the pace of the pitch to his advantage. All his fifty-plus scores this season have come in the second innings. 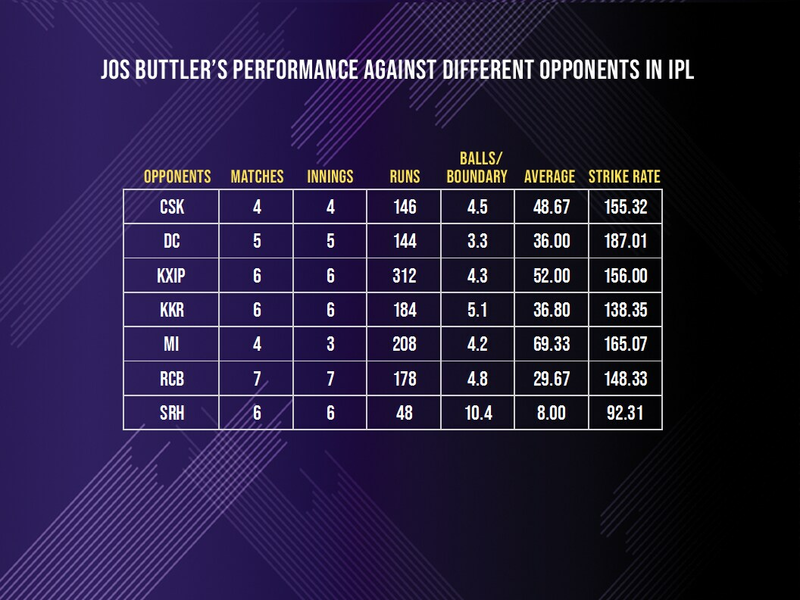 Although he stuttered a bit after a good start to the season, Buttler remains one of the top three run-scorers in the IPL since last year. He has 836 runs in 20 innings with eight scores of 50 or more in this time frame. The only others to have scored more are KL Rahul with 976 runs and Rishabh Pant with 906 runs. No overseas player has more runs than Buttler in this time-frame. What's even more significant is the fact that amongst the players to score 300 or more runs in this time frame, only five players have scored quicker than Buttler. He has scored at a rate of 9.3 runs/over in these two years in the IPL. Buttler, with his spectacular 89, seems to have a special liking for Mumbai Indians. He has an average of 69.33 against them in four matches (the best against any team) while scoring at a rate of 165.07 (the second best strike rate against any IPL team). Buttler smashed seven sixes and eight fours in his innings at the Wankhede on Saturday and it takes his balls/boundary count to 4.2, which is his best against any team in the IPL. It isn't just the Mumbai attack that favoured him, though. The Wankhede is another surface he enjoys batting on. At the ground, he now has an average of 34.92 in 15 matches with a strike rate of 152.34. This is his second best on any ground in India (minimum 5 matches) after Rajasthan Royals’ home ground in Jaipur. He overcame his nemesis, Jasprit Bumrah, in the process. In T20s, Bumrah had dismissed Buttler thrice in 15 balls. On Saturday, he was circumspect against the Mumbai strike bowler and scored just 8 off 8 balls against him. The planned onslaught saw him pick and target the right bowlers. He targeted Joseph and used his pace on a true surface taking him for 28 in an over. Buttler has taken his tally of runs in the season to 288 in seven matches. He averages 41.14 this year at a strike rate of 153.19. In his last three years in the IPL, Buttler has always scored at a strike rate between 153 and 156. The match-winning knock at Wankhede would go a long way in boosting Rajasthan's morale after a poor start to the season.